Adrian Davey Bird & Wildlife Photography: Yellowhammer Power Ballad. Near Launceston, Cornwall, May 2017. 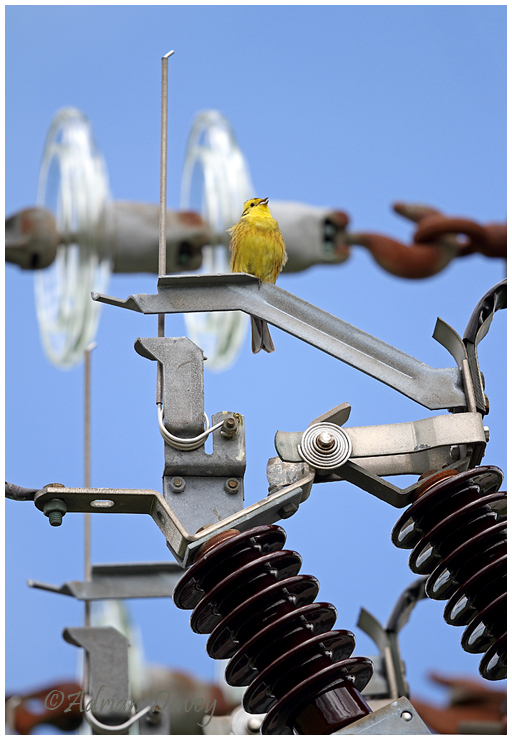 I was driving along a country lane when I heard a Yellowhammer singing, I stopped the car in a very convenient lay-by and noticed the lovely male singing away at the top of a electricity transformer, my 500mm lens and beanbag were close to hand and I was able to get some nice shots showing the bird and including the electrics. This photo got as far as the shortlist in the British Wildlife Photography Awards in the urban Wildlife category,( but actually the pole coud'nt have been in a more rural setting! ).